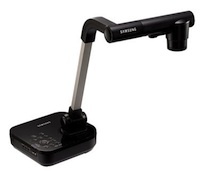 Samsung Techwin this month introduced the SamCam 860, a 1.4 megapixel classroom document camera. The SamCam 860 also incorporates a number of video features for both capture and play. The SamCam 860 offers a 1.4 megapixel resolution and 48x total zoom (6x optical zoom, 8x digital). It also offers 30 FPS output and SXGA (1,280 x 1,024) resolution. The company said there is no image streaking present in the video recording. Mac OS X and Windows compatibility. The company said pricing varies based on the number of units purchased, but it starts at less than $800.